Believe it or not, the fourth quarter is right around the corner and it’s that time of year to start thinking about your email marketing campaigns for your business in order to make sure you’re in the minds of your customers. 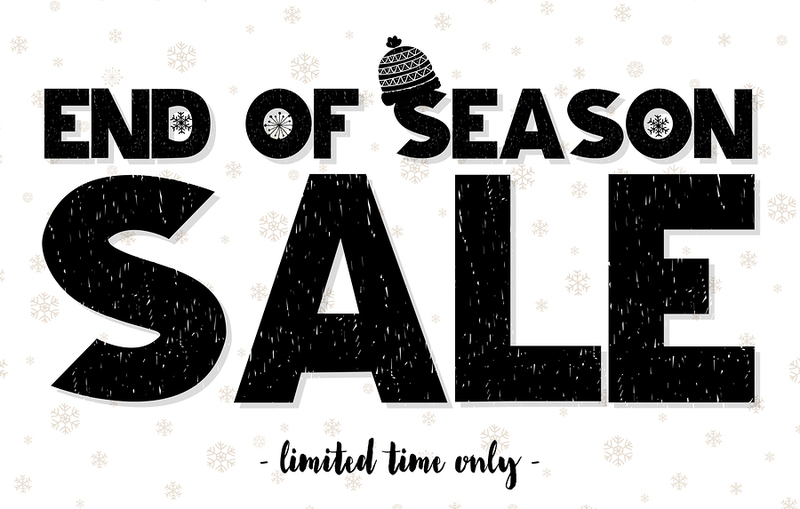 Seasonal campaigns are the perfect way to draw in new customers, keep current customers interested and satisfied, and to ensure you don’t lag behind your competitors during the time of year when customers are looking for ways to spend money. Even better, there are plenty of ways to make your email marketing efforts work even better for you. Whether it’s through new lead generation forms, split testing different landing pages, setting up new autoresponders or even going live with your first set of remarketing ads — email marketing is where it’s at! With all of these marketing methods in mind, it’s now time to take advantage of the four major holidays during the fourth quarter (Halloween, Thanksgiving, Black Friday, and Christmas) by ramping up your seasonal email marketing campaigns – here’s how to prepare. You’re not the only one preparing your email marketing campaigns for the holidays – remember that all of your competitors, even ones you don’t even have on your radar, are sending out email campaigns during this time as well. This is the time of year when customers are receiving the most marketing, so you’ll have to come up with a creative campaign in order to stand out and get customers to even open your email without scrolling past in their inbox. So how do you do that? Keep it trendy, but relevant to your base. If your demographic won’t know the trendy meme you incorporate into your campaign, it’s probably not the right direction to head in. But, if you’re targeting millennials who will definitely be able to understand – whole different story. If you have the ability to create email campaigns that are personalized to your audience based on demographics and location, that’s also a great way to help your customers feel like you’re tailoring your content just for them – which you are, but most of them won’t be familiar with how email marketing works! It’s a win-win for everyone. After Christmas clearance, pre-Black Friday sales, or deals on shipping before Christmas are all great opportunities to wrangle more customers onto your website during the holiday season. You can capture customers by offering clearance sales during those last four months, which is perfect timing considering how eager customers are to make purchases during that time. You can offer deals on shipping, which is especially helpful during the holidays when customers are shipping tons of packages across the country for friends and family. And, you could even create a marketing campaign that lets customers know that they’re close to the last day that you can possibly ship a gift before Christmas. You can even regionalize your campaigns so that your customers get notified when they’d need to ship based on where they live relative to your warehouses. It’s simple, it’s effective, and, most importantly, it’s helpful to the customer. The opportunities are endless – you don’t need to send email marketing campaigns on the actual holidays. You can, but you really want your customers to shop before, during and after the holidays because that’s when the deals matter the most to them. And most importantly, email marketing during the holidays works – a recent campaign reported that email was the most important marketing channel for holiday marketing. A Forbes survey discovered that more customers plan to buy online during the holidays than in stores – something that can be further utilized by campaigns with clear call to actions and easy click-throughs to your site! We can also examine each of the 4th quarter holidays and big shopping events through the visual below. You can create a loyal following of happy customers with deals and bonuses for taking advantage of your marketing during the holidays. And, although customers are spending more money during the holidays, they’re also keen to find a good deal. They might find that their favorite online retailer doesn’t offer free shipping, so they check in with the nearest competitor, who happens to offer free shipping. Where do you think they’ll make their purchase? It doesn’t cost much on your end to offer customers incentives for shopping from your site, and making sure that you highlight the deal in your subject line is sure to draw in customers who are hunting for coupons and deals before they start shopping. A common practice is to offer incentives when customers spend a certain amount of money on the site – say they spend $50, they get $5 off of their purchase. It’s not much, but it makes the customer feel like they’re being rewarded by spending their money with you. 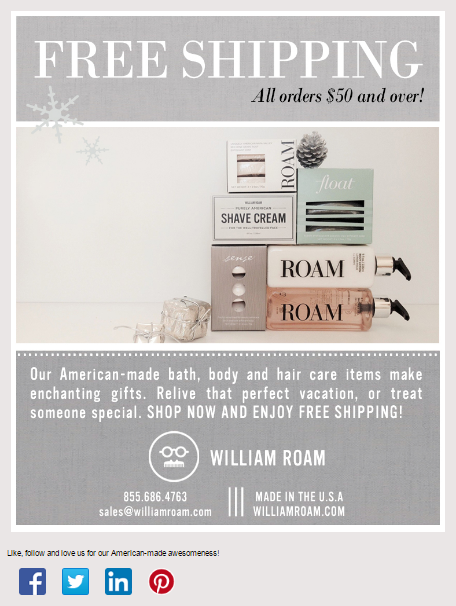 To see some great ideas and example on how you can increase business and customer engagement with offer deals and promotional mailings, be sure to check out these 30 examples from Constant Contact. The end goal here is to continually reward customers who are subscribed to your mailing list. Offer them a special coupon or discount that rewards them for staying loyal to your brand, and make it an exclusive deal that they get to enjoy. Although you may not get new subscribers through this method, you’ll keep your current subscribers happy and feeling appreciated by your brand. This method should be used by all marketers, no matter what season or holiday, but it’s especially important during the holidays when customers are spending the most money. After they make a purchase on your site, be sure that they receive a relevant, seasonal email that thanks them for their purchase and offers and incentive to come back and buy a few more things. Most likely, their purchase on your site wasn’t the last one they had to make before finalizing their holiday shopping. So, reel them back in with a coupon code, an offer for similar products, or reminding them that your promotional sale lasts for a few more days if they want to come back for more. These types of emails are important for engaging your customers and staying relevant in their inboxes. 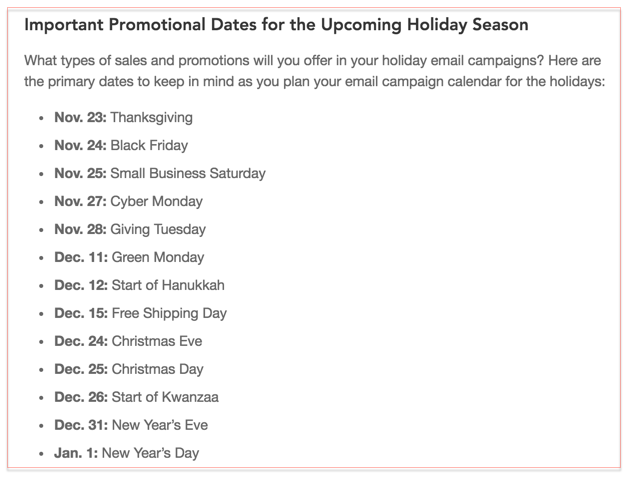 Want more tips on how to prepare your email marketing campaigns for the holiday season? Check out this article on 10 tips for a merry and profitable holiday season. And, if you’re looking for more tips, go straight to the experts – most email marketing hosts offer great tips for consumers on how to market during the holiday season. The 4th quarter of the year is always the most hectic for shoppers and businesses around the world. 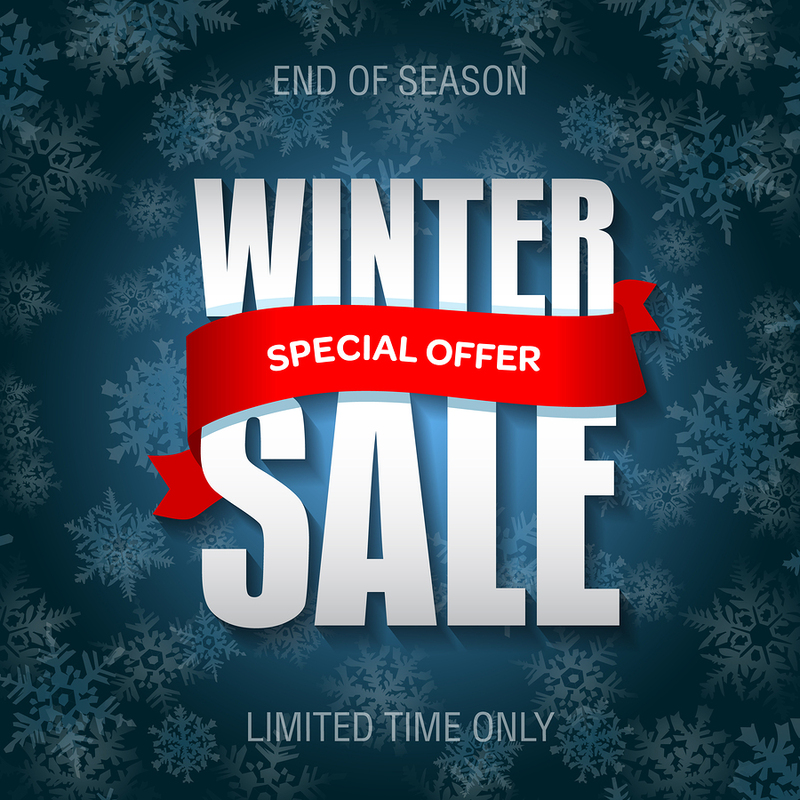 As much attention as there is on this time of the year, if you have a winning strategy in place from day one, your seasonal promotions and marketing efforts will be that much easier. To have a consistent supply of new email subscribers joining your mailing list and going into sales funnel daily, be sure to contact AfterOffers.com. Not only will you find an endless supply of new customers joining your most effective form of online advertising and marketing, you will also be pleased to know they are all 100% opt-in subscribers that are actually interested in what you have to offer.